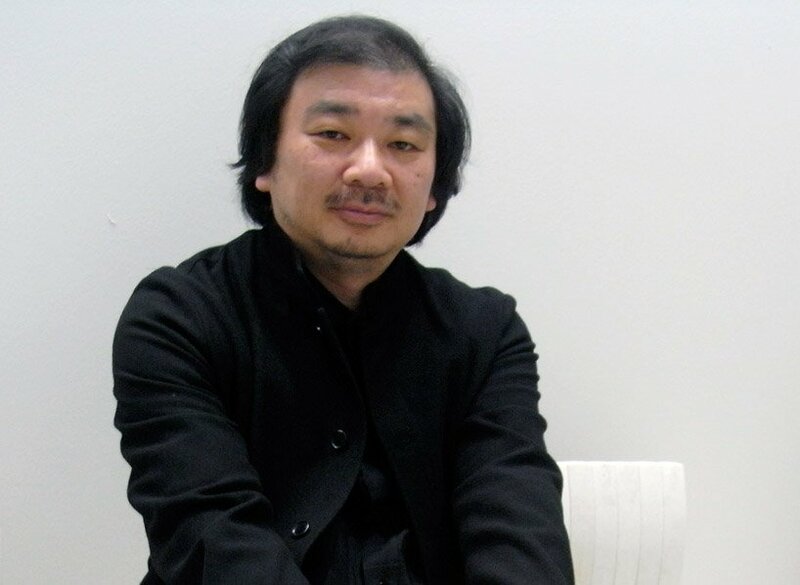 designboom met shigeru ban in milan, italy on april 22nd, 2009..
what is the best moment of the day?dinner time, as this is the only time I have to relax. what kind of music do you listen to at the moment?jazz and classical music. what books do you have on your bedside table?I’ve been reading some type of japanese history book. 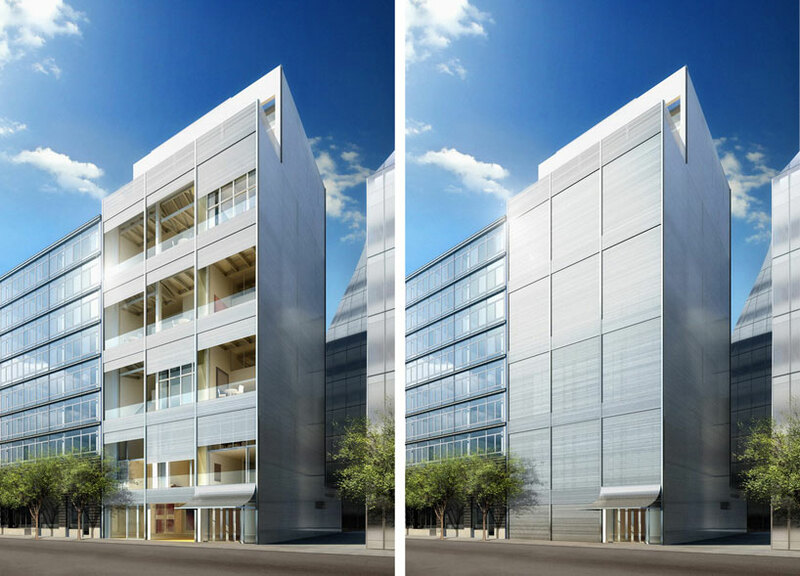 the ‘metal shutter house’, located at 524 west 19th street, in manhattan, new york,is shigeru ban’s first condominium residences in the US. the facade motorized perforated metal shutters serve as light-modulating privacy screen.the roll-up nature of the facade and the pivoting glass windows open completely, thus blurring the boundary between the inside and outsideunder construction. do you read design / architecture magazines?I don’t read it I just look over it.I think its not so important to follow the architectural news. where do you get news from?the newspaper. containart pavilion. singapore biennale, september 2008built with 150 shipping containers and recyclable paper tubeslocated at central promontory site, marina bay. I assume you notice how women dress.do you have any preferences?I prefer the simple look . it also depends on the occasionits nice to wear different colors for different occasions. 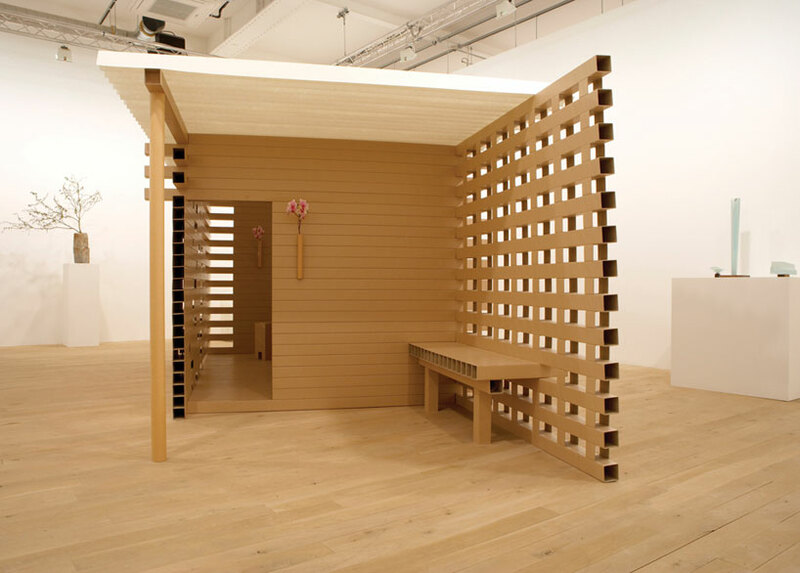 in april 2008, Phillips de Pury auctioned shigeru ban’s paper tea house for £31,700. do you have any pets?no. no time. when you were a child, did you want to become an architect?no, I wanted to be a carpenter. 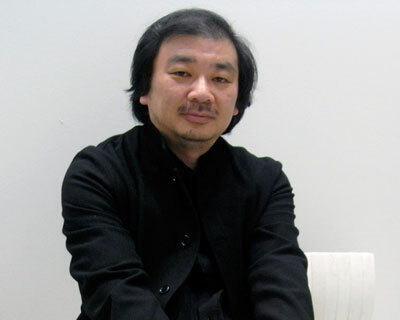 in june 2008 shigeru ban’s artek pavilion kit was auctioned by sotheby’s for $602,500.see more pictures here. where do you work on your designs and projects?anywhere at anytime.it could be on a plane, train, bus or in my bed. do you discuss your work with other architects?I discuss with my staff and partner but not with other architects.just inside my office. describe your style, like a good friend of yours would describe it.actually my best friends are my partners … and I have a good friend in paris, in tokyo and new york.they say that I don’t like to come back to things I’ve already resolved and many of my structures are not meant to be permanent. I’ve always been interested in using material.in a new way. how many people work in your office or are collaborating with you steadily?I have about 18 people in tokyo, 10 in paris and 5 in new york. so you regularly travel from new york to tokyo to paris,that’s a busy life. do you have time for family?I just work, I don’t have time for family. please describe an evolution in your work,from your first projects to the present day.I think my work has been continually changing since the beginning. do you have a favorite material ?I particularly like steel, but paper too can be strong and permanent.we need to get rid of material prejudices. who would you like to design something for?actually I’m interested in designing anything from a chair to a museum, a refugee house to an airport – anything. I don’t have any particular person I want to work with. I do not choose anyone like refugees or poor people,I have projects which come to me.I have seen the works of alvar aalto and where he has curated every little detail inside his house. I would like to design everything inside of a building, but usually we architects do not receive enough of these projects to be able to do this. the earthquake shelters, your groundbreaking work of using non-traditional materials, are you continuing these projects?I did a project in sichuan, china last year after the earthquake, building temporary schools and currentlyI’m meeting with some architects in genoa (italy) talking about the area of l’aquila near rome, you know where theearthquake happened in april this year.regarding the use of non-traditional materials, in 2007 I designed a bridge, located over the gardon river insouthern france, it is made almost entirely out of cardboard tubes. in 2007 you designed the paper pavillion for artek / UPS in finland, are you going to continueto experiment with new materials?I don’t develop many new materials. I usually use existing material differently. 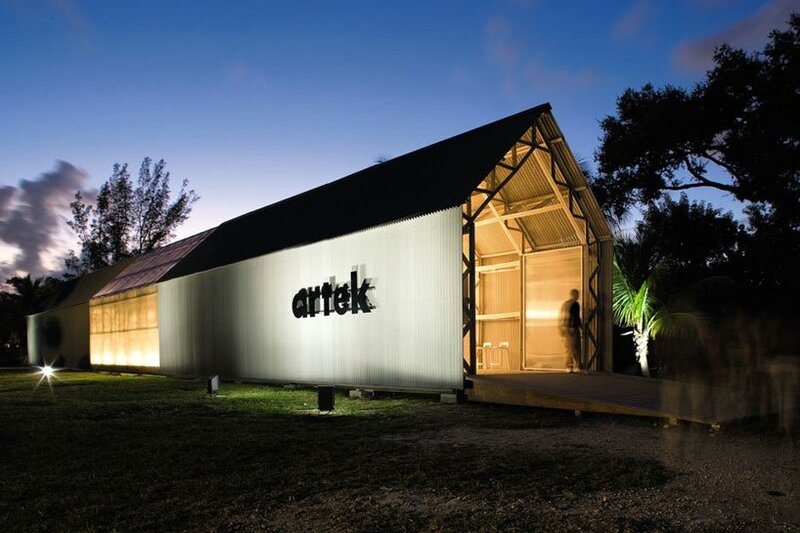 in this instance it was unusual as artek came to me and asked me to work with this particular material created from industrial waste of paper and plastic. this year I have made a seating system with that recycledcomposite. the’10-unit system’ is based on the ‘L-unit system’ I did back in 1993. 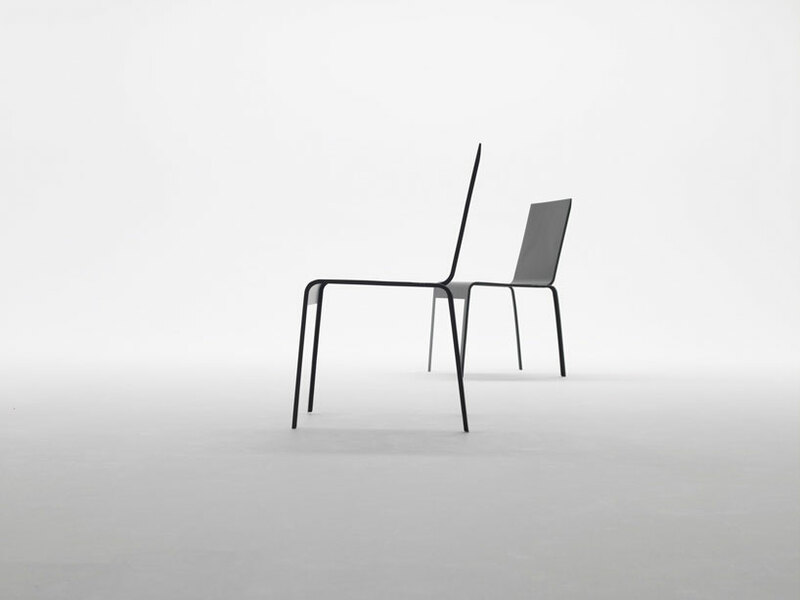 L-shaped units which can be combined to make chairs, benches, seating lines. what other objects have you created?most recently a prototype of a light-weight chair that uses carbon fiber TENAX®, in these days on show at the tokyo fiber senseware exhibition and a bowl for the small danish company ‘when objects work’..I have never designed tableware before, so it was challenging. I think its interesting to use an idea from my architecture and convert it into a small object. the bowls take their shape from the metz centre pompidou –the geometry is the same. well, actually this is a prototype. I’ve tried to make this in wood but we are still in thedeveloping process. its very difficult to construct due to all the bending that is required.its really a new kind of experimentation. and what else? some lighting fixtures in the eighties and a few cardboard chairs for cappellini in 1998. …and a ball point pencil for a company in hawaii in 2004.
design is an art form – in the field of design ‘form’ is also used as expression, where do you collocate your approach?my main concern is that the product should be functional. but sometimes you have the choice between two or more solutions ?in that instance I would consider what is more functional, and more economical. I try to be very pragmatic. is there any designer and/or architect from the past, you appreciate a lot? mies van der rohe, my professor john hejduk from cooper union school of architecture and alvar aalto. and those still working / contemporary? I particularly like otto frei otto as I worked with him and he was very influential to me, emilio ambasz … many. what advice would you give to the young?actually I miss teaching (I quit university last year) advice? travel! then you can understand different cultures of the world and don’t depend on the computer. what are you afraid of regarding the future?earthquakes! Thanks for your personal marvelous posting! I truly enjoyed reading it, you might be a great author.I will remember to bookmark your blog and definitely will come back from now on. I want to encourage you to continue your great job, have a nice day!